The Amazon Wind Farm was North Carolina's first major wind project. In signing wide-ranging solar legislation into law last week, North Carolina Gov. Roy Cooper issued an executive order to blunt the impact of the bill’s 18-month moratorium on wind power – tacked on amid controversy in the legislative session’s final hours. Little surprised to see the wind provision enacted as part of an otherwise popular solar policy, clean energy advocates welcomed the decree. But in the face of a hostile state Senate, they say the fate of the industry after January 2019 is far from certain. Cooper’s order directs his administration to expedite “behind the scenes work,” so it can issue new permits – as appropriate – as soon as possible after the suspension ends. Apex Clean Energy, the Charlottesville company pursuing a wind farm an hour west of the Outer Banks, said the directive convinced them not to abandon their plans — at least for now. Like Apex, other clean energy businesses said the governor did the best he could under the circumstances. But clean energy advocates are already gearing up for the next battle to ensure the moratorium expires on schedule – and that debilitating restrictions don’t take its place. With abundant winds, vast acreages of farmlands and forests suitable for turbines, and access to a 13-state transmission grid, northeastern North Carolina is ripe for wind power development. 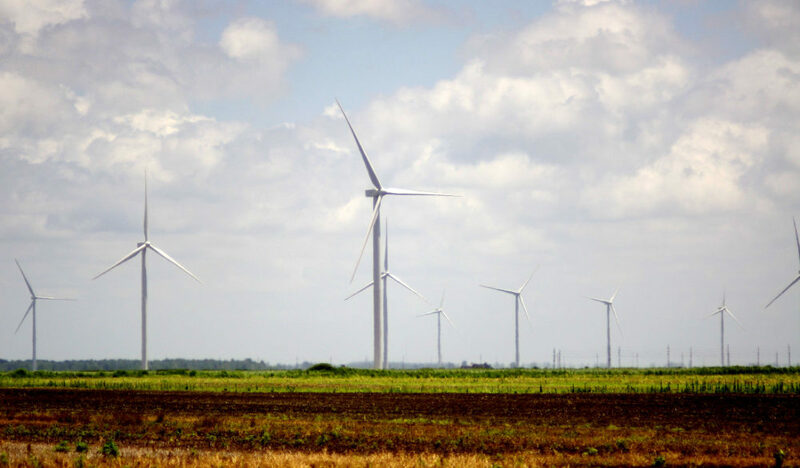 Those dynamics bore fruit early this year when Amazon Wind Farm U.S. East, a $400 million, 104-turbine project near Elizabeth City, became the state’s first major project to deliver electricity. Two other farms are underway nearby: Apex Clean Energy’s Timbermill Wind in Chowan and Perquimans counties, and Little Alligator in Tyrrell, developed by RES Americas. For the most part, county commissioners, economic development officials and landowners welcome these projects with open arms; they see them as a valuable source of revenue that can help support public schools and address other infrastructure needs. But the new farms face a major hurdle in the form of the state Senate, home to a determined, powerful foe in majority leader Harry Brown, the moratorium’s chief backer, and a dearth of GOP senators willing or inclined to counter him. While these standards may protect military operations writ large, Brown contends they don’t ensure North Carolina will protect its bases from relocation or downsizing. A delay in permitting new projects is needed, he says, to allow time for the creation of maps that will identify areas where wind turbines will interfere with military flight-training paths. Brown’s rationale – which almost no current military officials endorse – exasperates many local wind-power proponents, who feel they’re being unfairly denied desperately needed economic investment. “I try to be respectful, but it’s poppycock,” said Rep. Bob Steinburg, a Republican whose district includes the Amazon wind farm as well as the two farms underway. A special source of frustration for wind power backers: maps produced in May show that Little Alligator and Timbermill – the projects ensnared in the moratorium – are not in conflict with nearby Seymour Johnson Air Force Base. Part of a joint land use study funded by the U.S. Department of Defense, the maps were produced in collaboration with military personnel as well as county commissioners, local chambers of commerce, and other community members. A periodic undertaking for U.S. military installations and their surrounding communities, the joint land use study is designed to reduce land use conflicts and help participating locales keep their bases – not much different from the process Brown claims is lacking. “Why would you knowingly put the two projects – that you knew had already been vetted – on hold for a process that the study has already satisfied?” complained Clegg. Using the same collaborative process Clegg helped chair, Marine Corps Air Station Cherry Point produced maps of its own two years ago. Those documents say turbines are incompatible with the military within the entire study area of Carteret, Craven and Pamlico counties – along with a small piece of Jones County. Experts say those counties have excellent wind resources, but they lack access to the same grid as northeastern North Carolina. Thus, many worry the new statewide maps produced at Brown’s behest will look more like Cherry Point’s and less like Seymour Johnson’s – ruling out wind power where it is most viable and most welcomed. Because the new law directs the maps to be finished by May of next year “in order to inform the development of policies…during the 2018 Regular Session,” advocates also fear Brown will push to write those restrictive maps into the law – just as he attempted to do last summer. Despite his history on the issue, Brown denies he’s trying to outlaw wind statewide. “After this study is done, I’m sure the wind industry will be just fine,” he told his colleagues on the Senate floor. Advocates say Brown could be right – but only if the study is conducted in an open, transparent fashion. To some, the process already looks more obtuse than most legislative studies. The law tasks the Legislative Services Officer – who typically oversees the daily operations of the legislative building complex, not policy – with hiring a contractor, who’s instructed to consult with military personnel and others with knowledge of its footprint. The contractor will then report back to the officer – rather than to one of the many standing committees of lawmakers that hold public meetings about policy. The current Legislative Services Officer is Paul Coble, a former Republican Wake County commissioner and Raleigh mayor who once, somewhat infamously, attacked his county’s sustainability efforts as part of an international conspiracy against private property. In any case, the outcome of the study could mean life or death for Apex’s 105-turbine, $300 million wind farm in North Carolina. There is among North Carolina’s military communities some skepticism of wind energy; at least one retired colonel says it can never be compatible with flight training. But by far, the bigger challenge for wind energy advocates is the state Senate itself. On the Senate floor, numerous GOP senators backed Brown’s argument for the moratorium. Sen. Jeff Tarte of Mecklenburg County was the only Republican to vote against it – a rare sign of dissent within the normally homogenous caucus. Tarte’s lone flag stands in contrast to the House, where proponents like Rep. Steinburg say wind renewable energy is backed by wide margins across the aisle – largely because of its potential to inject investment and tax revenue into counties struggling economically. Clean energy advocates say support in the House – along with polls showing Republican voters favor wind and solar– shows that, with effort, the Senate could come around, too. “The main purpose of this bill is to save the taxpayers of North Carolina money,” says bill sponsor Rep. John Szoka.